In contrast to climacteric fruits, where ethylene is known to be pivotal, the regulation of ripening in non-climacteric fruits is not well understood. In the non-climacteric strawberry (Fragaria anannassa), auxin and abscisic acid (ABA) are thought to be important, but the roles of other hormones suggested to be involved in fruit development and ripening are not clear. Here changes in the levels of indole-3-acetic acid (IAA), ABA, GA1, and castasterone from anthesis to fully ripened fruit are reported. The levels of IAA and GA1 rise early in fruit development before dropping to low levels prior to colour accumulation. Castasterone levels are highest at anthesis and drop to very low levels well before ripening commences, suggesting that brassinosteroids do not play an important role in ripening in strawberry. ABA levels are low at anthesis and gradually rise through development and ripening. The synthetic auxin, 1-naphthaleneacetic acid (NAA), can delay ripening, but the application of GA3, the gibberellin biosythesis inhibitor paclobutrazol, and ABA had no significant effect. IAA and ABA levels are higher in the developing achenes than in the receptacle tissue and may be important for receptacle enlargement and ripening, and seed maturation, respectively. Contrary to a recent report, the biologically active GA4 was not detected. 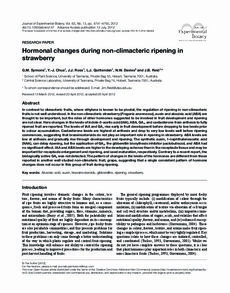 The pattern of changes in the levels of the hormones are different from those reported in another well studied non-climateric fruit, grape, suggesting that a single consistent pattern of hormone changes does not occur in this group of fruit during ripening.